So in the example above the normal.dotm and Word.officeUI files will be added to the MSP (Windows Install Patch) file. Now, looking back at the Location column in the Add files step in the OCT we can see that the files in this example are to be copied into the [AppDataFolder]Microsoft\… etc. A user’s AppData folder is stored in the %APPDATA% environment variable and it’s usually something like: c:\Users\%username%\AppData\Roaming. But since all users who log on to the computer, not just the one installing Office, needs these files they are copied from the PatchFiles folder into the AppData\Roaming folder for each new user who starts one of the Office applications. 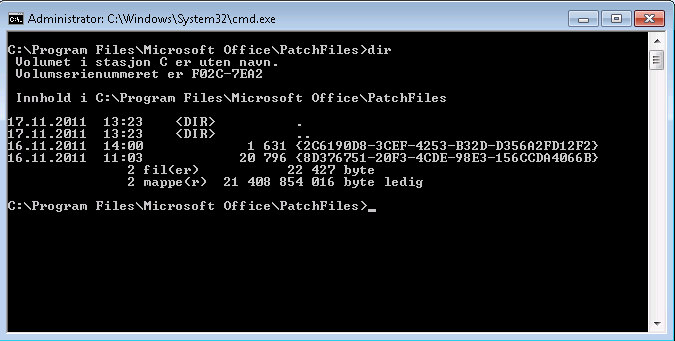 This feature also works the same way when Office is installed by the SYSTEM account, and not a user; the files are copied from the MSP file into the PatchFiles folder and from there to the user’s AppData folder. Office 2010 Professional Plus (32-bit) deployed to Windows XP Professional Service Pack 3 (32-bit) clients with System Center Configuration Manager (SCCM) 2007 R2 (64-bit). 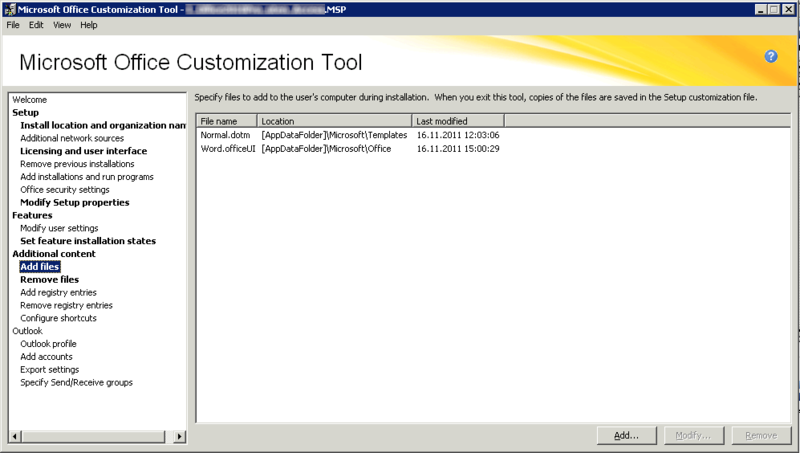 Office 2010 configured with Office Customization Tool (OCT) according to Microsoft guidelines. At 11.11.2011 08:29 Office 2010 restarts the installation after the reboot, even though it actually succeeded before the reboot, and the reboot is just to complete the installation. This is interpreted as a modification to the existing install and setup.exe prompts the user for what modifications to make. The user cannot see this, however, because he cannot interact with the program. CcmExec lets setup.exe run until the max run time is reached and then terminates setup.exe (11.11.2011 13:28) logging the install as a failure. The Office 2010 setup log, located in %systemroot%\System32\Temp indicates that the install is successful, but that a restart is needed. 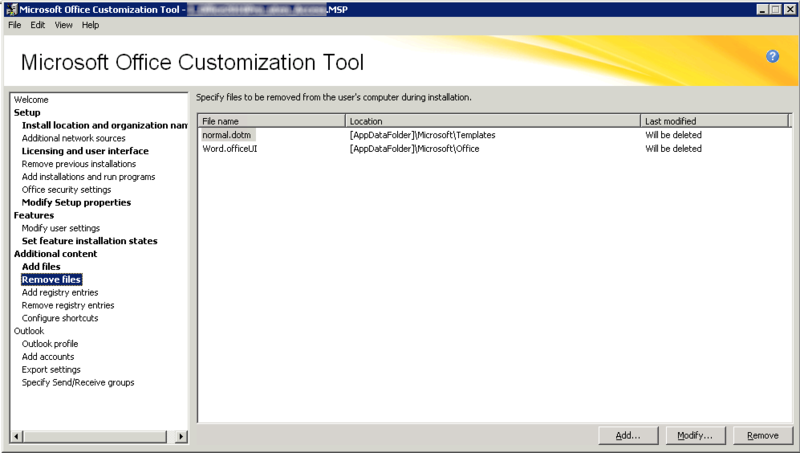 With this setting in the MSP file the installation of Office 2010 will not be “fooled” by its own restart and complete successfully. You will first receive a status of Program completed successfully (reboot pending), until you initiate a restart on your own. After this restart the status will change to Program completed with success. Office 2010 seems to be fully functional even without performing this restart immediately, but the advertisement status in SCCM will not change until you restart. Reports from other who have experiences similar issues indicate that the forced restart only happens on Windows XP computers, not Windows 7. I have not tested this myself.